On Monday, March 25th in Rīga, the nominees for the 2019 Annual Latvian Literary Award were announced at the bookstore “NicePlace Telpa”. 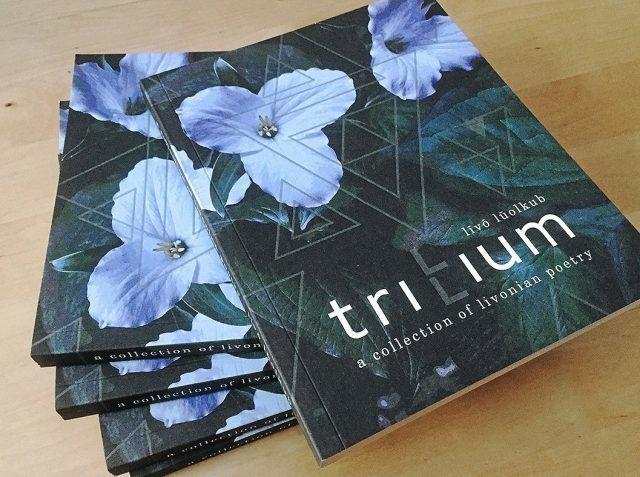 The lifetime achievement award was awarded to London poet and translator Velta Sniķere, while the special prize for outstanding contributions to literature was awarded to the Livonian-English bilingual poetry collection “Trilium / Trillium”. The expert commission decided this year to award the special prize for outstanding contributions to literature to the Livonian-English bilingual poetry collection “Trilium / Trillium”. The authors of this collection are Baiba Damberga, Valts Ernštreits, Ķempi Kārl, and the English translations of their poems are the work of Uldis Balodis and Ryan van Winkle. The collection came into being during the months before Latvia was featured as a Market Focus nation at the London Book Fair in 2018. The collection was published by the Livonian Culture Centre (Līvõ Kultūr sidām). “The work of these three poets in the Livonian-English poetry collection “Trillium” is, without a doubt, outstanding and unique in the sense that it is the first book of Livonian poetry translated into English. One feels a sense of wonder and almost disbelief that such a small nation could have so many good poets, one also feels a need to protect this fragile flower. I’m personally most touched by this book in that it is a testament to toughness, perseverance, and even heroism – and this heroism isn’t without a purpose. Efforts to maintain diversity and a distinct identity in the global cultural melting pot may be inherently correct, not only because it seems poetic, but also because it is a pragmatic course of action,” writes literary critic and the head of the awards commission Anda Baklāne. The Annual Latvian Literary Awards will be presented on April 25, 2019 at 6 pm at Sūkņu stacija in Rīga located at Maskavas iela 196. The award recipients will receive a monetary award as well as a special Annual Latvian Literary Award lamp – designed by the design studio “MĀJO” – symbolising the award. This year’s visual identity was created by artist Mareks Hofmanis. This year’s awards ceremony is being organised by publicist Anete Konste, theatre and motion picture director Marta Elīna Martinsone, architect and stage designer Ivars Veinbergs, stage designer and costume designer Sintija Jēkabsone. The event will be hosted by actor Inga Alsiņa-Lasmane and Gatis Maliks, while Sniedze Prauliņa will oversee the cosmic musical interludes.